You can top up the shared account after your campaign has passed moderation. Click at the top of the page. 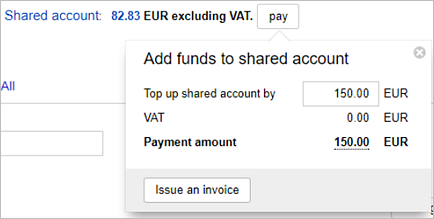 On theShared Account page you will see the Pay button. There are different payment options available in different countries. You can pay in U.S. dollars via bank wire transfer from a U.S. bank account to the Yandex Inc. bank account. If you are paying for ads for the first time, the payer must upload a scanned copy of their passport or drivers license to the interface. Verification of the uploaded documents may take up to three business days. If your documents have been verified, your order will start as soon as the payment has cleared in the Yandex Inc. account. If you have questions about payments, you can send email to info-payment@support.yandex.com or call +1 650 838-0880. Company credentials with billing information and contacts. Verification of the uploaded documents may take up to three business days. You can pay using Visa or MasterCard in euros, Swiss francs, or U.S. dollars. The payment is credited within 15 minutes. On the My campaigns page, click Pay and enter the amount. Click Issue an invoice. On the preview page, review the terms and conditions and make sure all the details are entered correctly. Click Issue an invoice. You will receive a bill to pay with a bank card. To enter your bank card details, click Pay. If your documents have been verified, your order will start as soon as Yandex receives the money. 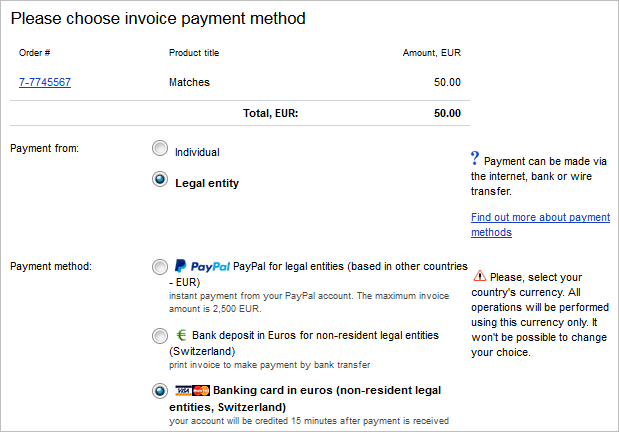 You can pay via PayPal in euros, Swiss francs, or U.S. dollars. The payment is credited within 15 minutes. Read and accept the terms and conditions, then click Issue an invoice. If you want to choose a different payment option, click change payer or payment method. Check the payment information, then click Pay. 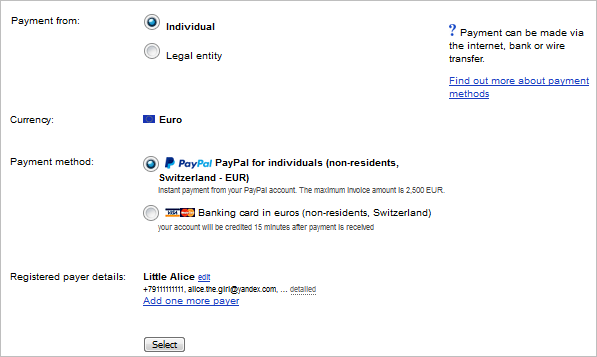 This takes you to the PayPal page, where you can transfer money to your account. You can pay via bank wire transfer in euros, Swiss francs, or U.S. dollars. You will receive a bank transfer order. You can print it, download it as a Word document, or send it by email. Pay the invoice in a bank or using an online banking system. To get your first invoice, you need to upload a scan of a business registration certificate that proves that your company is a legal resident of Switzerland. Verification of the uploaded documents may take up to two business days. Read the terms and conditions, make sure all the information is entered correctly, then click Issue an invoice. If the payer information is incorrect or you want to choose a different payment option, click change payer or payment method. On the My campaigns page, click Pay and enter the amount to credit to the shared account. Click Issue an invoice. A company that signs a credit agreement with Yandex AG can add funds to a Yandex.Direct account on credit and pay later. On the preview page, make sure that the correct information is shown for the contract number and your company details as the payer. Click Top-up now, pay later. The specified amount will be credited to your company's shared account on Yandex.Direct. 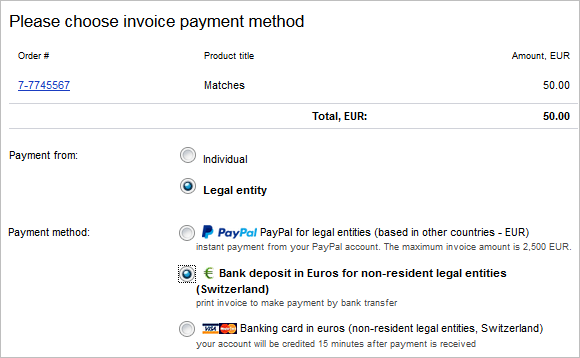 You can check your invoices and print them for payment in the Invoices section. The payer is entered incorrectly. 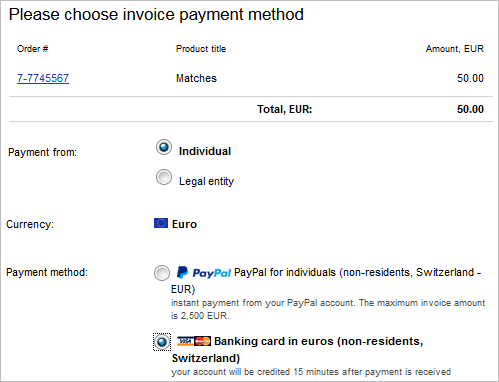 To change the payer, click change payer or payment method, choose your company in Payer, and click Select. You can see the invoice number and the amount owed in the interface. Pay this invoice via bank wire transfer. You can pay the invoice with cash at any bank that accepts personal payments. 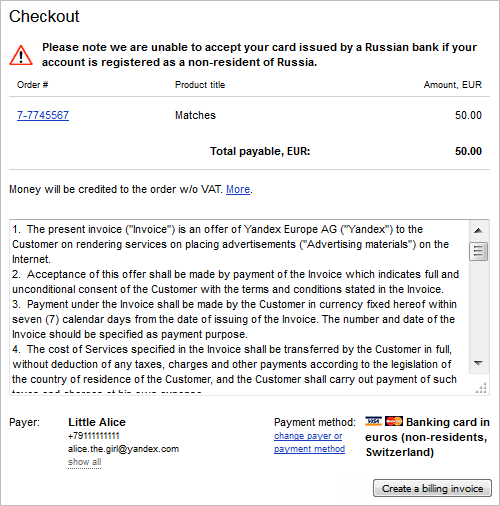 Your ads will start being served as soon as Yandex receives payment confirmation. You can pay the invoice using VISA or MasterCard. The payment is credited within 15 minutes. You can pay the invoice via bank wire transfer. 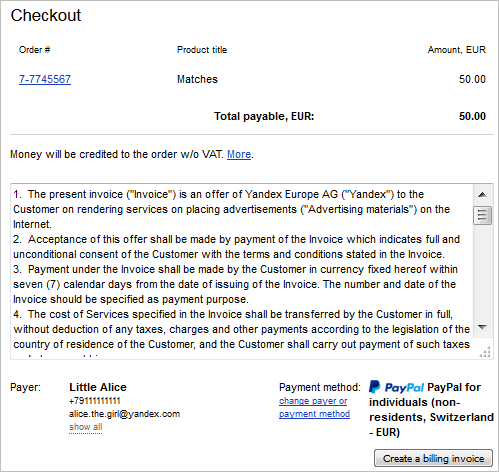 Your ads will start being served as soon as Yandex receives payment confirmation. You can pay the invoice using VISA or MasterCard. The payment is credited within 15 minutes. 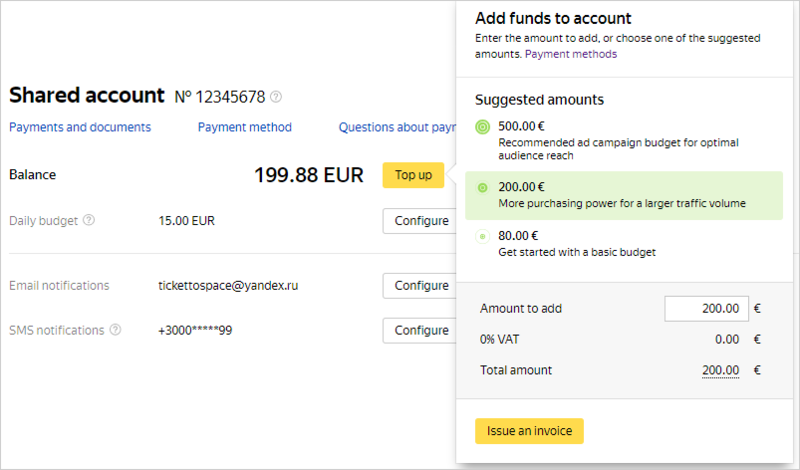 Your ads will start being served as soon as Yandex receives payment confirmation. We don't enter into agreements with residents of countries or territories that are considered tax havens ("offshore jurisdictions") or that do not disclose information on financial transactions ("secrecy jurisdictions"). See See the order of the Ministry of Finance of the Russian Federation #180N dated Nov 13, 2007. Bank wire transfer in euros, Swiss francs, or U.S. dollars. Bank card in euros, Swiss francs, or U.S. dollars. We accept VISA and MasterCard. The payment is credited within 15 minutes. 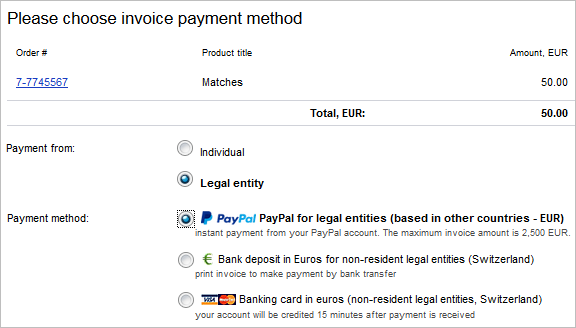 PayPal in euros, Swiss francs, or U.S. dollars. The payment is credited within 15 minutes. 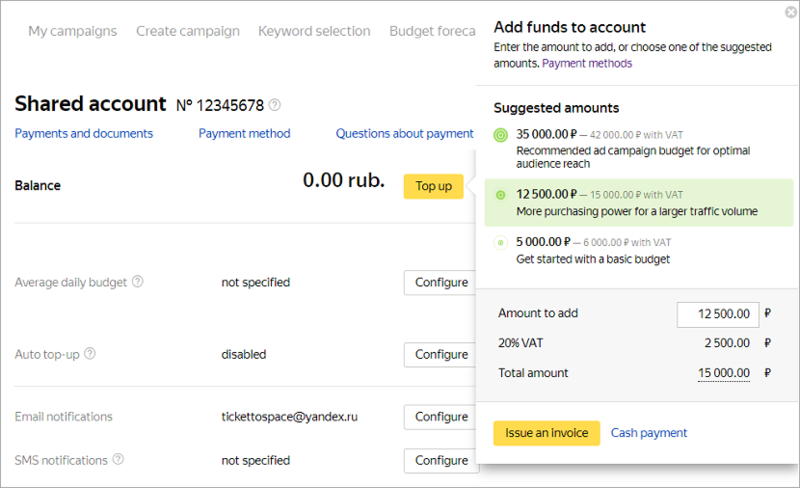 If you have questions about paying for ad campaigns, you can contact the payments team at info-payment@support.yandex.com. To issue an invoice, you need to upload a scan of a document confirming the company's registration as a business. Verification of this document may take up to two business days.